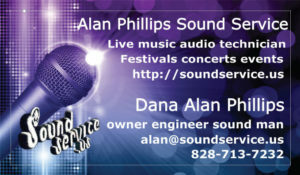 Based in Asheville North Carolina (Fairview) an entertainment sound system with audio engineer is for hire. Fees include delivery, load in, setup, sound check, performance, load out. Shows may be booked directly through the phone and email links at the bottom of each page. 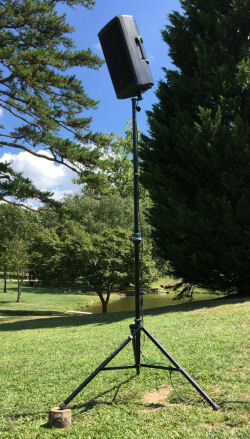 Intended for clarity, not intense volume, this compact mobile sound system is suited for acoustic music, musical theater, concerts, and festivals, as well as live audio production recording. For smaller spaces JBL EON612 self powered speakers on tall stands is normally sufficient, while the full system includes two 18″ front loaded sub-woofers. For safety reasons there is no sound snake and console in the audience, for it is not always required, nor desired. I prefer wireless mixing where there is a lot of foot traffic, such as during conferences, commencements, weddings, and many concerts. The Mackie DL32R is great for this purpose. 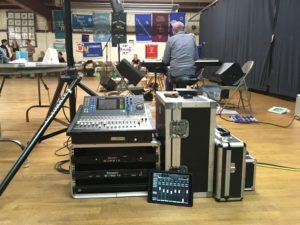 It is a Multi-user mixer controlled with an iPad. House mix and individual stage mixes may be controlled by performers through a downloadable App. With 32 Analog inputs and 14 outputs, the DL32R provides up to ten stage mixes, stereo mains, and stereo subs. It includes on board equalization, dynamics, output delays, and remote 32 channel multi-track recording with music playback. Stage system: The DL32R mixer typically resides on stage in monitor world with four EV Sx80’s speakers, and two Turbosound TXD-12M floor monitors. Three Stewart Audio World 1.2 convection cooled digital amplifiers silently power the stage monitors, and are perfect for quiet locations. Lights: Two Chauvet Mini 4 Bar LED light trees with effects and audio triggers. Spoken word events and ceremonies PA system: two full range EON612 speakers are normally adequate for small and medium spaces. The EON’s are pole mounted up high and tilted down for even coverage. For larger audiences two EV sx80’s may be added near the back of the venue, to which the audio is delayed. The Mackie DL32R and Yamaha MG102c ten channel conferencing mixers are available with iPod and laptop hookups. Included are four Shure SM57 instrument mics, three Shure SM58 vocal mics, three Audio Technica PRO 35 clip on condenser mics, three Sennheiser Evolution e604 drum mics, Rode M5 matched pair overheads, and one PG52 kick drum microphone. The Audio Technica 4033 large diaphragm microphone is perfect for Bluegrass and soloists. 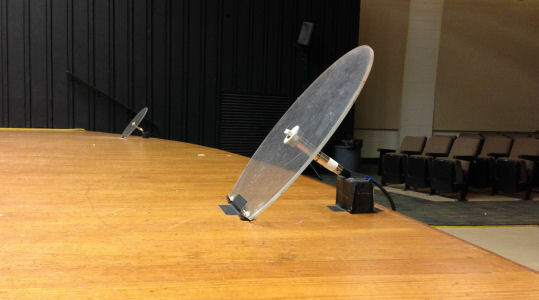 For theatrical and choral events, three transparent Crown PZM disc microphones can be mounted on stage or suspended. The wireless microphone system consists of four receivers with two Shure PG58 hand-held mics, and four PG1 wireless body packs with Microphone Madness omni-directional earset microphones.